Monday 9:30am-5:30pm , Tuesday 9:30am-5:30pm , Wednesday 9:30am-5:30pm , Thursday 9:30am-9:00pm , Friday 9:30am-9:00pm , Saturday 9:30am-5:00pm , Sunday 11:00am-5:00pm . Plaza Paquette Mont-Laurier offer more than 35 brand name stores. Plaza Paquette Mont-Laurier is located in Mont-Laurier, Quebec - 939 Boulevard Albiny Paquette, Mont-Laurier, QC J9L 3J1, Canada (GPS: 46.551995, -75.486395). 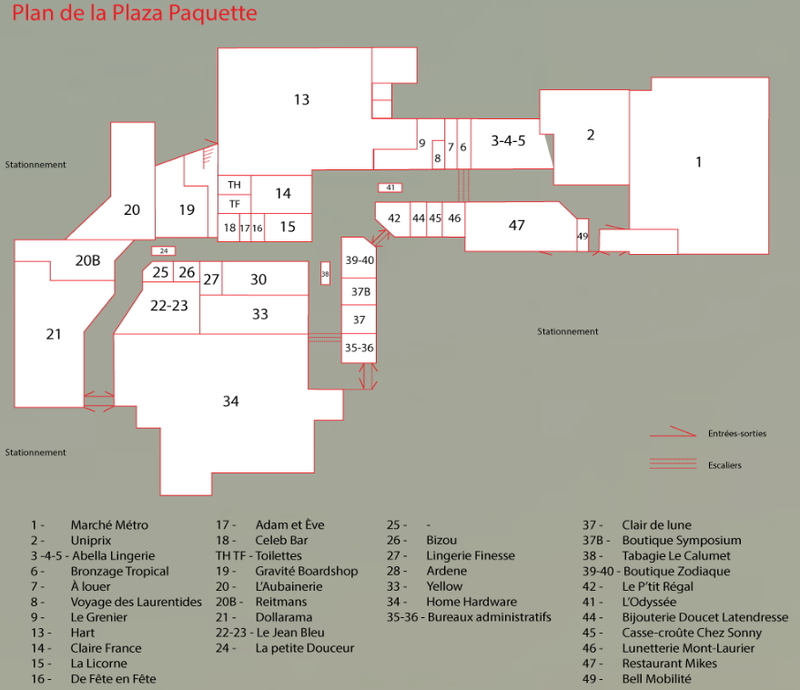 Look at the list of stores in Plaza Paquette Mont-Laurier, hours, location and information about mall and special events, sales, coupons. You can choose store from list below and get detail information - other stores locations for the brand, location, shopping hours, phone, map, directions contact. Plaza Paquette Mont-Laurier is one of the best shopping place for spend your free time - mall/shopping center has all types of stores - outlets, department, fashion, traditional and more. Have you ever visited Plaza Paquette Mont-Laurier? Do not forget to write shopping review and rate your satisfaction. Plaza Paquette Mont-Laurier - Mont-Laurier Area, Quebec J9L 3J1. Click on the button and get directions to Plaza Paquette Mont-Laurier. Mall/Shopping center is also displayed on the map with gps for your navigation. Give us your experience with Plaza Paquette Mont-Laurier by writing a short review.